What is Off Page SEO and How Is It Used? When it comes to improving your website’s ranking within search engines, there are a few elements to consider. Off page SEO is one of the most important aspects of your success. Here, we answer the question “What is off page SEO?” and explain how you can use it to improve your brand’s position online. Once you have all your website content pages optimised, you should turn your attention to building credible and meaningful inbound links to your website. This can also help to build your social media influence, especially if you can use social media to link to your website pages. You might be wondering what But how exactly do you do this? You will be making use of a technique called off page SEO. Off page SEO refers to a set of techniques that you can use to boost your search engine rankings – it includes link-building efforts and social media promotion. Basically, you will use methods that are not directly found on your webpage, to help boost your popularity within search engines. Measure your inbound links. There are many tools that you can use; a very popular one to use is Open Site Explorer. Although there is a paid subscription option, there are plenty of functionalities to use as a free user. Look at your competitors. You can view all your inbound links, see from which domains they come from, and compare metrics to some of your competitors. Keep on top of what’s happening out there: If you want to follow specific or multiple keywords and be notified every time it’s mentioned, we recommend signing up to Google Alerts. You’ll be able to keep track of things important to you, such as your competitors, mentions of your website, or just about any keywords. Audit those potentially toxic backlinks. A full in-depth backlink audit can take a long time but even a quick run-through can help you to pick out potentially hazardous backlinks which can lead to penalties in search engines. Scan for the highest authority links to your competitors. This will give you an opportunity for the two get links from the same sources for your website. See if you have any inbound links from .edu and .org domains. These are usually quite powerful and will count in your favour. Gradually build your inbound links. If you build links too quickly, Google’s algorithms will likely pick it up and you may be penalised. Always be on the lookout for a good opportunity to build links. Get your staff to think in the same way and use these opportunities to increase the inbound links. Building up links to your website can often be a long, draining process for the majority of us. Fortunately you can find some success in cutting down that time by using tools such as Awario. Simply enter your own website details, such as your products or certain brands, and this tool will help to return these keywords mentioned on the internet. Look out for the keywords that are missing a backlink to your website and try to get in touch with the site owner or webmasters. Asking for a link shouldn’t be complex, and seeing as they’ve already written about you chances are it shouldn’t be too much hassle for them to fulfill this request. Another great opportunity that you can use to your benefit is social media. Social media platforms allow your business to generate increased brand awareness and to help boost inbound links to your website. It’s a well-known fact that social signals contribute to the popularity of your website. This includes actions like Facebook ‘likes’ and shares, Google+ circles and Twitter follower counts. Social media reviews also help to boost your search engine rankings. Always make sure that your business as active Facebook, Twitter, LinkedIn and Google+ profiles. The post regular updates as well as interesting articles and blog posts on your profile. This is a great way to promote your content and to generate links back to your website. You will also allow users to share and promote your content to their own friends and followers. Online reviews on platforms such as Google+ and Yelp will carry a lot of weight in terms of boosting your inbound links. Not only will the increase the number of links, but it also gives you great SEO benefits since these sites are very popular with authority content. This off page SEO checklist should give you a great head start, however there are a lot more techniques to use when it comes to boosting your site’s SEO. 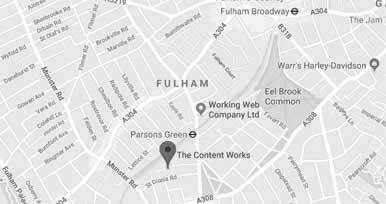 Speak to the experts at The Content Works to help you craft great content for your website and increase your incoming links.